Longarm quilting is the process by which a longarm quilting machine is used to stitch together 3 layers which are in every finished quilt: a quilt top, quilt batting and quilt backing. Quilting using a longarm machine can take significantly less time than other quilting methods and when computerized is very exact. These machines allow quilters to have their quilts finished without going through the time-consuming process associated with hand quilting. The longarm quilting machine comes equipped with an industrial sewing head, a worktable, several fabric rollers, and a metal frame. 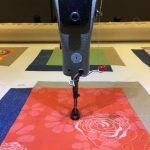 At Living Threads we longarm quilt using a Gammill Statler Stitcher quilting machine that was purchased by donors given specifically for the purchase of this machine. Prior to owning our own Gammill Statler Stitcher all memory quilts we created were outsourced for longarm quilting. The overall dimensions of the Gammill Statler Stitcher frame is 12 feet in length and can accommodate up to a king size quilt. The depth (throat) of the machine head is 30 inches which allows the longarm quilters to have a large visible area to stitch at one time before rolling the quilt to stitch the next section. Edge-to-edge designs span the length of the quilt and can be repeated in rows to produce an all-over design on the quilt top. This method of longarm machine quilting is popular due to the minimal amount of work required by the longarm quilter, therefore, resulting in a lower cost for the customer. Custom work is done when the quilter wishes for the quilt blocks to contain individual designs repeated in each block. The background and borders are chosen from stock designs to reflect an individual’s interests, hobbies, names, phrases, etc. Personalized quilting is done by quilting designs and/or images to reflect an individual’s interests, hobbies, important words/phrases, etc. This method is the most time-consuming and expensive of the three styles, but is the most preferred by our clients. "There is a roller coaster of emotions as I work on a quilt. I see the articles of clothing, lovingly arranged into a beautiful collage of memories, and I imagine the joy that this loved one was to their family and the sadness that their death brings. I want to do my best to honor the loved one and their memory." "My favorite aspect of longarm quilting is personalizing the quilts. When I'm quilting I imagine some of the things that might be said when the family sees the completed quilt; "do you remember when…..? ", or "he or she always loved .....", or "he or she was always good at.....". It is an emotional experience to work on a quilt, one in memory of a child is especially hard."